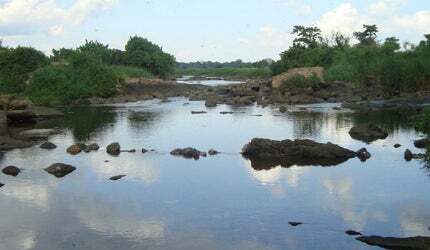 The 188MW Isimba hydropower project is being developed on White Nile River in Uganda. Image: courtesy of Uganda Electricity Generation Company. The hydropower project broke ground on 5 October 2013 and is expected to come online in 2017. Image: courtesy of China International Water & Electric Corporation. The plant will comprise a concrete gravity dam on the left channel and a clay-core rock fill dam on the right channel of the Nile river. Image: courtesy of China International Water & Electric Corporation. The 188MW Isimba hydropower project is is one of the most important hydropower projects that the Ugandan Government has initiated on the White Nile, to ease the severe power shortages in Uganda, and accelerate the development of local economy. Considered to be the fourth biggest hydropower project in Uganda, the Isimba HPP is expected to generate hydroelectric power at 68 cents per kWh, the lowest in East Africa. Ground-breaking ceremony for the project was conducted on October 5, 2013 and the construction is expected to be completed in 40 months. The project is anticipated to come online in 2017. It is expected to generate 1,039GWh of electricity a year and increase the country’s total electric capacity by 23%. The project construction is expected to create approximately 1,000 jobs. The 180MW hydroelectric facility in the Lower Kihansi Gorge, south central Tanzania, has been on stream since December 1999. The Isimba hydropower project will be located on the Victoria Nile, downstream of the 205MW Bujagali Falls hydropower plant. The project will extend over approximately 2,867.6 acres of land and will comprise a concrete gravity dam, a clay-core rock fill dam, a spillway, a power house, electro-mechanical equipment, switching stations, and auxiliary power transmission works. The concrete dam, to be located on the left side, will consist of a reservoir retaining structure in front of the erection bay, while the rock fill type with central clay core right dam will provide storage for emergency gates and stop logs. The powerhouse structure will feature four 45.8MW Kaplan turbines in the left dam. The Isimba HPP external switchyard will be situated at the left bank of the river. It will be connected with the powerhouse by four overhead lines. "The generated power will be transmitted to the substation at Bujagali HPP through a 132kV Isimba-Bujagali double circuit transmission line.."
The new Isimba substation will be a double busbar type with two line bays, four transformer bays, one bus coupler, and two future bays. The generated power will be transmitted to the substation at Bujagali HPP through a 132kV Isimba-Bujagali double circuit transmission line. The 42km-long transmission line will have a 30m wayleave, with a 5m right of way. "In addition to the construction of the dam and the double circuit transmission line, the project also includes the construction of a 33kV power line from Kayunga town to the project site." In addition to the construction of the dam and the double circuit transmission line, the project also includes the construction of a 33kV power line from Kayunga town to the project site, along Busana Road. Other works will include the construction of a road across river Nile, to connect Kayunga and Kamuli districts. The Ugandan project, which is estimated to cost $570m, received debt financing from the China Export-Import Bank (Exim). In March 2015, the Parliament of Uganda also approved $482.5m loan from the Exim Bank. On behalf of the Government of Uganda, the Uganda Electricity Generation Company (UETCL) was appointed as the Project Implementing Agency for the Isimba hydro power plant. China International Water & Electric Corporation (CWE) was awarded the engineering, procurement, and construction (EPC) contract worth $568m for the project. The contract, signed between CWE, and the Ministry of Energy and Mineral Development of Uganda on 6 September 2013 includes the construction of the power plant and the Isimba-Bujagali 132kV interconnection line. CWE engaged Geotech Solutions for conducting site supplementary geological investigation, drilling and rock grouting works. Energy Infratech was engaged as the supervision consultant for the project. The joint venture of Fichtner and Norplan awarded a contract worth $3.8m, in 2010, to carry out feasibility study and prepare tender documents for the Isimba hydro power plant and the transmission line to Bujagali. Kagga and Partners, a local Ugandan company, was engaged as a sub-consultant to the joint venture.